In my long past youth, my local sci-fi/fantasy bookstore sold a book about Hammer Films, the British studio that made a bevy of horror movies in the 50's, 60's, and 70's. Full of posters and publicity stills of distinguished thespians in monster makeup and delicate English roses with heaving cleavage, Hammer has since held a near-legendary place in my culture psyche. When Sir Christopher Lee hurled himself into my life with the one-two punch of Saruman and Count Dooku during my freshman year of high school, Hammer became an even higher priority. But I never saw a Hammer film until last year when I rented the classic Hound of the Baskervilles (with Peter Cushing as Sherlock Holmes and Lee as Sir Henry Baskerville) in preparation for Guy Ritchie's own Holmes picture. Now, I rectify a mistake a decade in the making with (Horror of) Dracula. Do we really need a synopsis? This is a Dracula movie. It's all a matter of how different from other Dracula movies it is. This one's pretty divergent from Bram Stoker's plot, moving the setting to Germany for some reason (but retaining British names and accents) and making Jonathan Harker a vampire hunting librarian. The point is Saruman is Dracula and Grand Moff Tarkin is Van Helsing. 'Nuff said. 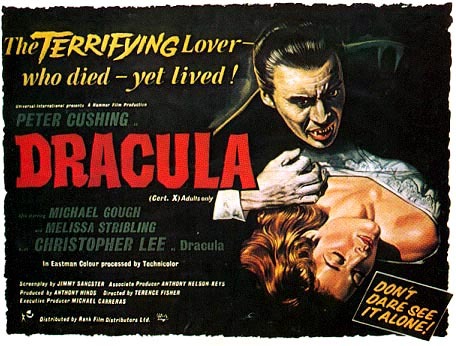 This Hammer horror turned out pretty much how I thought it would: campy and wonderful. Is it a particularly well made film? Not really. Is it well-acted? If you like the taste of ham, sure. Is it necessary? Absolutely, and I say that with full knowledge of the number of Dracula movies out there. This must have been amazing as a matinee back in 1958, a great cheap way to blow an hour and a half. It's pretty obvious and not at all challenging, but oh the Technicolor! But was it scary? Unless Christopher Lee with fluorescent red liquid dripping out of his mouth is the stuff of your nightmares, this shouldn't scare modern viewers in the least.